Yesterday, I introduced the Art of Crafting and touched upon how crafting will play a bigger role within the new era upon Althéa. Players could choose to let their PCs get by on the items they manage to find or purchase, but due to the change in magic and skills upon Althéa, it would pay them to invest some time and knowledge into constructing their own items, including weapons and armour. Eventually, they may even gain enough knowledge to enchant their items and bring about a new range of magikal weapons for the new era! CRAFT WEAPON: There will still be access to some simple weapons in the new era, but weapons requiring greater skill than the most basic type will be reserved for those in power or to those few gifted artisans who the PCs may be able to talk into selling their wares. Therefore, any adventurer who anticipates the chance of combat may want to learn more about basic weapon crafting, or at least team up with someone who has the skill. CRAFT ARMOUR: The same holds true for armour as it does weapons. While basic armour may still be bought from merchants, the sensible adventurer will either learn more about crafting armour for themselves, or at least team up with someone who can keep them supplied. Access to blacksmith's workbench and smith hammer. Metal Ingots, wooden planks, creature hides and a weapon or armour mold. The quality of the ingots, planks or hides determines the skill required to work with them, but also offer a better type of weapon or armour with added benefits as a result. CRAFT ALCHEMY: To begin with, most items built within the new era will not be magikal in any way. However, those PCs with the alchemy craft learn the secrets of extracting essences from the remains of creatures required for enchanting. This process of extracting essences from the remains of creatures is called alchemy, and it is through this craft that PCs are able to make such things as poisons and grenades, as well as collect the essences required for making magikal weapons. Access to an alchemical workbench and a mortar and pestle. 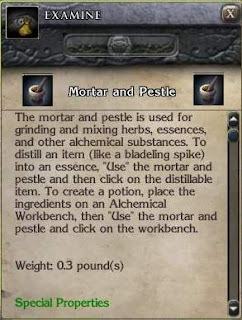 Essences from distilled body parts using the mortar and pestle. Alchemy recipes and secrets. Further feats are required to make use of the essences collected via the alchemy skill. 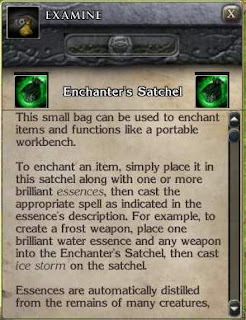 Eventually, every PC will want to improve the items they have, and this normally means turning basic items into enchanted ones, or what is more traditionally known as a magikal item! Turning a mundane item into a magikal one is normally within the realm of the wizard or sorcerer, but basically can be done by anyone who has the right feat: Create Magical Arms and Armor Feat and/or the Create Wondrous Items Feat. There are three other magikal item creation feats, but they are for specific objects only: Craft Wand, Scribe Scroll and Brew Potion. While these feats are useful for such basic items, it is the function of the more powerful feats highlighted above (that can enchant ordinary items) of which we are interested in for now. In both instances, the magician's workbench is often required to combine magic essences, special ingredients (e.g. gems) and a casting of a spell along with the item to be enchanted. If successful, the object that was being worked is returned with a new enchantment of some kind, varying from improved defences for armour or improved damage for weapons for example. The combination of ingredients required for such an enchanting is often a closely guarded secret, and the PC must first try to find or learn of the procedure required before carrying out the task if they wish to be sure of success. As the PC learns more about enchanting, so they will discover improved and easier ways to turn a mundane item into a magikal one. 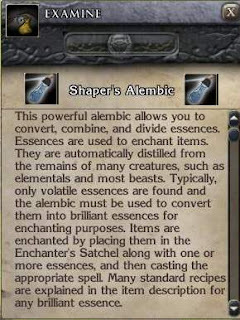 They will eventually acquire such items as the Shaper's Alembic and an Enchanter's Satchel, which allow for working with items in the field with other special essences rather than being forced to find a work bench. Essentially, depending upon the PCs commitment to their art will help determine how much they will be able to craft in the new era. If they choose to ignore these skills and feats, then the more they will have to rely on others to locate and supply more useful items. If they can master the skills and feats themselves, however, then they will only be limited by their own determination and ability.